I decided to buy that Throne last night to earn the Nook Points. I have a LOT now, so I decided to go ahead and order the Toad hat. Nobody else seems to wear that and I like being different! If anyone would like to buy my extra throne, I’ll sell it for the clearance price of 500K bells! That’s 200K less than full price! Comment or send me an email if you’d like to buy it off me. The King’s Beard was on sale so I reluctantly bought it for 8000 bells. I guess I should have it, in case I ever want to try my regal attire during a Gracie evaluation. The Toad hat and Toad shirt arrived (I ordered the shirt, obviously) and I immediately tried it on. At first I was disappointed b/c the Toad hat is actually a helmet, meaning you can’t wear any glasses or accessories with it. I was hoping to wear my 3D glasses with the hat. Then I was looking at the shirt and hat together, and it just looks wierd. The hat is white with red spots, the shirt is red with white spots. 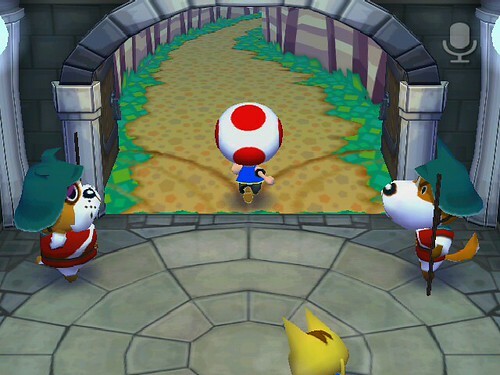 I did a google search for images of Toad and realized that the REAL Toad wears a little vest and goes bare-chested! So I went to Able’s to design a replica of the blue vest, with yellow piping. Now Squirt is looking more like Toad… but it’s just not quite right. I think Squirt’s blue eyes ruin the image. 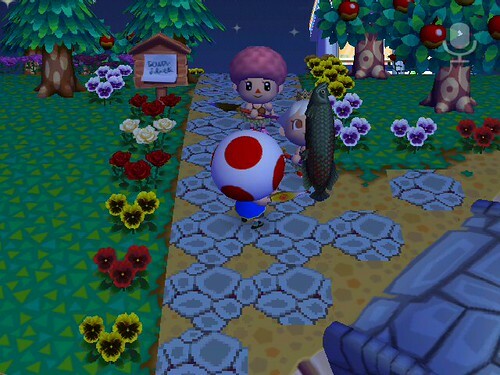 Toad is supposed to have little black beady eyes. Ahh well. Katie was crying at the Town Hall today. Ugh!!! Now we have all this noise pollution to deal with. Katie wants to go to Doomdoom. I guess Nintendo is trying to make up for the little screw up last week when I had Kaitlin, but Katie could not be found in Doomdoom at all. I talked to Vella and she said Kaitlin is in her town. I’ll try to bring Katie over there this afternoon to put an end to this nonsense! And yay, I’ll get a prize! Hehehehe! Don’t worry Vella, if I get something cool, you can clone it. And if I get the Portrait… you can just HAVE that cuz I hate that thing lol! When I was finally able to get Katie to follow me up to the gate, I checked with Copper to see who’s was open. Doomdoom wasn’t open yet, so I quickly ditched the kitty and ran off to Cairnie! You can't really tell, but Katie fell on her face when I took off lol! It is July in Cairnie right now, so I knew I should head down to the beach and look for that elusive Elephant Beetle! I scared a bunch of beetles away, but none of them were Elephant so it’s ok, lol. I did manage to catch a Lantern Fly, as well as a SHARK! I forgot to take a picture though. Guess you’ll just have to believe me! My friend Magoo also showed up in Cairnie, and I was very excited to see her! Hadn’t talked to her in a while, so it was nice to catch up a little! Pal's catch of the day, and Magoo's cool afro! Once I had delivered Katie and returned back to Shaolin, I noticed Wendell walking around. Quietly I snuck off without him seeing me. I don’t need any new patterns today! Thanks for the sweet words of hope for our dear Plaahaus. I’ll be sad if we lose it but I’m sure it’ll be fun starting over, too. As long as we can get back Coco (my favorite) and Gaston (RSL’s favorite) and an island. I wish I could bid on your throne! Very exciting. I hope you enjoy Bunny Passover! We’re gonna do a bit of time traveling when we get the Wii back so we can experience it, too.